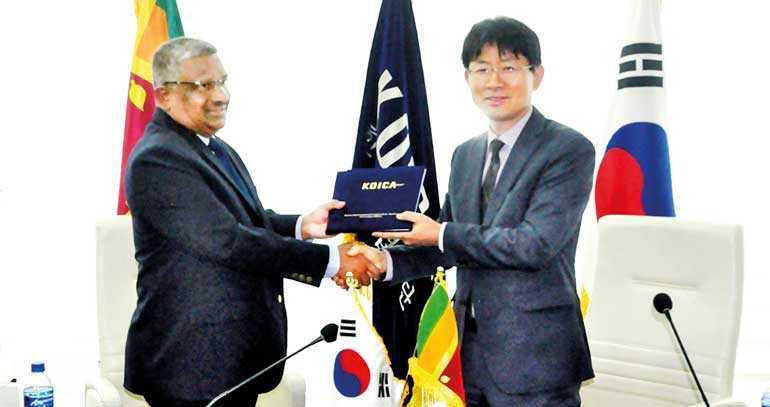 The Korea International Cooperation Agency (KOICA), the grant aid division of the Korean Embassy, legally based on the framework agreement on grant aid between the two countries, is providing a grant worth $ 6 million to enhance the export competitiveness of Sri Lankan agricultural products by improving plant quarantine capacity. The agreement between the two countries for the project was signed by KOICA Sri Lanka Office Country Director Dong Ku Lee, Ministry of Agriculture, Rural Economic Affairs, Livestock Development, Irrigation and Fisheries and Aquatic Resources Development Secretary K.D.S. Ruwanchandra, and Department of External Resources Director General Priyantha Rathnayake on 17 January at the Ministry of Agriculture. Agriculture Technology Additional Secretary Dr. Keerthi Hettiarachchi, while delivering the welcome speech, explained the current need in uplifting the export of agricultural products to boost the GDP of Sri Lanka. Dong Ku Lee, during his speech at the signing ceremony, remarked that as export of agricultural products plays a significant role in the gross export income to Sri Lanka, KOICA has decided to strengthen the agricultural sector by providing this grant. The main outputs of this project will be strengthening the plant quarantine capacity, supporting value chain development for agricultural export and expansion of Sri Lanka Good Agricultural Practice (SL-GAP), establishment of Plant Quarantine Information Management System. Among the sectors in the economy, Agriculture sector plays a key role and it continues to be the main pillar of the Sri Lankan economy since a majority of the population living in rural and plantation areas is engaged in agriculture for their livelihood. The sector provides employments for nearly 25% of the workforce and forms the resource base for a number of agro-based industries and agro-services and stimulates the economic growth through vertical and horizontal integration with other sectors in the economy. In Sri Lanka, agricultural exports hold a significant portion of total exports, and in future it is expected that agricultural exports will play an important role in economic development in Sri Lanka. Hence, the Government has recently been promoting the export of non-traditional items such as fruits and vegetables rather than traditional agricultural products such as tea and coconut. However, in order to expand exports of agricultural products, quarantine systems must comply with the importing countries’ quarantine conditions. Therefore, in order to export fruits and vegetables, it is necessary to establish a high-level advanced quarantine system required by the export target country. As a step forward, KOICA has decided to join hands in strengthening and modernising the Plant Quarantine Service in Sri Lanka. The KOICA Sri Lanka office strongly believes that the tangible parts of the project such as construction of Seaport Quarantine Station and provision of latest laboratory and ICT equipment to the Headquarters of the National Plant Quarantine Service and Airport Quarantine Station will not only bring significant improvement in the agriculture sector, but also the intangible parts such as capacity building of the agricultural sector human capital, providing the latest technology, enhancing the standard of procedures and upgrading the quality of quarantine service in Sri Lanka. It is also the hope of KOICA that their effort be fruitful in empowering overall export competitiveness of Sri Lankan agricultural products by improving plant quarantine capacity.